A good house for a family holiday but rather expensive. Plenty to do for a seaside holiday for the young people. 2018 was our fifth holiday at High Meadows, the large house suits our needs perfectly. Grandparents in the master suite, daughter 1 and family in the three bedroom area, daughter 2 and family in the two bedroom area. Our five grandchildren loved the garden they call the house "upside down" We have been taking holidays in and around St Mawes for 50 years on and off, so all the local beaches, ferries and NT locations are easy to plan. Recommend High Meadows without reservation. Reply from Sally Prince Thank you for your very helpful feedback and high scores for many of the ratings. However, as a guest who has stayed at High Meadows a number of times, I was concerned that you gave lower scores for cleanliness and condition on this occasion. I understand that the cleanliness point related to just one of the bathrooms and nearby wardrobe area. I have passed your comments on to our cleaners who normally do an excellent job and I am sure they will take extra care in future. I am also glad you like the improvements we have made to the patio doors and glass balconies, but I note the problems with the latches on two small side windows. We will have these windows looked at and also address the problem with the porch guttering. Thank you again and we look forward to welcoming you back to High Meadows very soon. We had a great time staying at High Meadows again. It was even better than we remembered. Facilities are great and the location is amazing. Thanks so much! A brilliant holiday house for a larger group. Beautiful gardens, sensational location, modern bathrooms and well equipped. Our perfect holiday property. We have just spent an amazing half term at High Meadows. What can I say, it was the best family holiday yet. Location, house and weather all fantastic. Will definitely be back. A great place to stay able to get to the North of Cornwall if you want to lots of places and beaches to visit. High Medowes a great place to stay, comfortable enough parking balconies and garden very pleasant to sit, great views from the kitchen and dining room. Great to be able to walk into the village, which we managed to down load a treasure trail with the grandchildren which we all enjoyed. We had a great holiday. Ideal house & location for a family Birthday celebration. BBQ locked in greenhouse so not available which was a shame. Our large extended family (aged 3-60+) had a lovely fortnight's holiday at High Meadows. The accommodation was excellent, very comfortable beds and really good showers (the wet room was very welcome after a day at the beach). There was also plenty of seating for the whole family and a very well-equipped kitchen. The 2 lounges with sky TV in both also kept the children well-entertained. The beach and town of St Mawes are only a 10 minute walk from the house. Our only criticism is that when we arrived there was dog hair all over the floors, what we assumed was dog slobber on the windows and more worryingly quite a lot of dog mess on the grass in the garden. With very young children this was unacceptable; obviously it is a pet-friendly house but we would hope not to see evidence of previous occupants' dogs when we arrived! But other than this we couldn't fault the house or its location. Reply from Sally Prince Thank you for your feedback which is much appreciated. I am so sorry about the dog hairs and marks on the windows. I have raised this with our cleaners and they will double check in future. We are a dog friendly house as we know how much dogs are part of the family and enjoy coming on holiday too. But we do ask dog owners to keep their dogs in the large utility area and not to allow them in bedrooms for exactly this reason. Our cleaners are only responsible for cleaning the house and not the garden. We also ask dog owners not to allow their pets to make a mess in the garden and if they do, they should of course clean up afterwards. 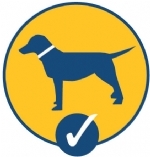 We will adjust our notes to dog owners to reflect your feedback and re-emphasise "house rules" for pets. Otherwise, we are glad you had a good holiday and look forward to welcoming you again in the future. If you are looking for somewhere to take a large family on holiday then this is the house for you. Comfortable, very well designed, enough space indoors and out that everyone has their own space and no one is underfoot. The kitchen was very well equipped and it was a joy to cook in. The house is a short walk to the centre from where you can get a ferry to Falmouth, it is also ideally placed for many walks, including the SW Coastal path. An excellent house / location for our extended family stay ( children, young and older adults). Facilities good, views and garden very pleasant. Location provided great access to fine walks and secluded beaches etc. Some maintenance issues which need dealing with, these have been referred to the booking agent separately. Reply from Sally Prince We are so glad you enjoyed your holiday and thank you for bringing our attention to some small things that you could not get working. Some guests switch the bathroom extractors off at the mains so they won't come on automatically and likewise the cooker extractor/light. We will add some further instructions for future guests. The broken pull cord in one bathroom will also be repaired. We really appreciate your feedback and hope we can welcome you back to High Meadows soon. We had a lovely family holiday at High Meadows with 3 generations of our family. The house was in a fantastic position for the beach and water and only a short stroll to the shops. The kitchen was very well stocked with every utensil we needed. We even managed a big family Easter roast dinner for 12!! The beds were very comfy and the layout suited our family with the bedrooms slightly separated. The shower room and the utility area were a fantastic bonus, wetsuits, sandy bodies and dogs all washed off without entering the house!! We would definitely recommend High Meadows to anyone wanting a large family home for a relaxing holiday. Well equipped house. Lovely views. We stayed in chilly March but had the weather been warmer would have enjoyed being out in the lovely garden , looked as though all equipment was available for outdoor eating and relaxing. Lovely area and handy for St Mawes centre and ferry. Really enjoyed our stay. Booking process excellent, as was the house. Really good bedroom size, and lost of them. Also the cleaner (via Cornwalls Cottages Ltd) posted something we left behind. We had a wonderful time at the High Meadows and we were a group of 11 people.. it is a perfect place for relaxation. The house was very clean and welcoming.Thing to keep in mind is the mobile network is poor, but had wifi. A party of eight of us had another excellent week in High Meadows. The lay out is very workable for different couples/singles & the town centre is less than ten minutes away. We would recommend having the Chef on Roseland to cook a meal for you - he did this for us & produced a gourmet dinner cheaper than most restaurants could. Our only criticism would be that we would have liked a set of glass wine glasses to drink out - most of them were plastic & only suitable for BBQs. We also felt that the cutlery was an odd mixture of designs & sizes - making it difficult to have uniform place settings. Reply from Sally Thank you for your helpful review and recommendations. I have not tried the Chef on Roseland yet and will certainly do so. Your comments on glasses and cutlery are fully noted. New wine glasses have been put in the cupboards. We always like to have plenty of knives and forks but there are two different sets so next time I am in the house, I will go through the cutlery drawers and sort everything out. So glad you enjoyed your holiday - hope you will visit us again. Floor plans wil appear here when available. High Meadows is a luxury, spacious, reverse level house which benefits from its own views over the Percuil River. Upstairs, the comfortable living room has a large balcony overlooking the garden. The dining room has a double aspect with wonderful river views on one side and a further balcony overlooking the garden on the other. The house has the benefit of a large utility room on the ground floor and boot room adjoining which is particularly useful for walking gear, wetsuits, sailing kit, dog basket etc. Absolutely ideal is that there is a shower / wet room inside the back door for sandy bodies. This property is one of the best large family houses to rent in St Mawes. Exquisite gardens and comfortable throughout, it is thoughtfully equipped and particularly suited to a large group gathering yet still some quiet spaces to relax and enjoy this wonderful spot in one of Cornwall's most idyllic villages. Ground Floor: Enter into the hallway with access through to all bedrooms. Master double bedroom has a 6' bed, en-suite bathroom with over bath shower and a seating area with sliding doors opening onto the garden. There is another a double bedroom with 5" bed and en-suite shower room with sliding doors to the garden. 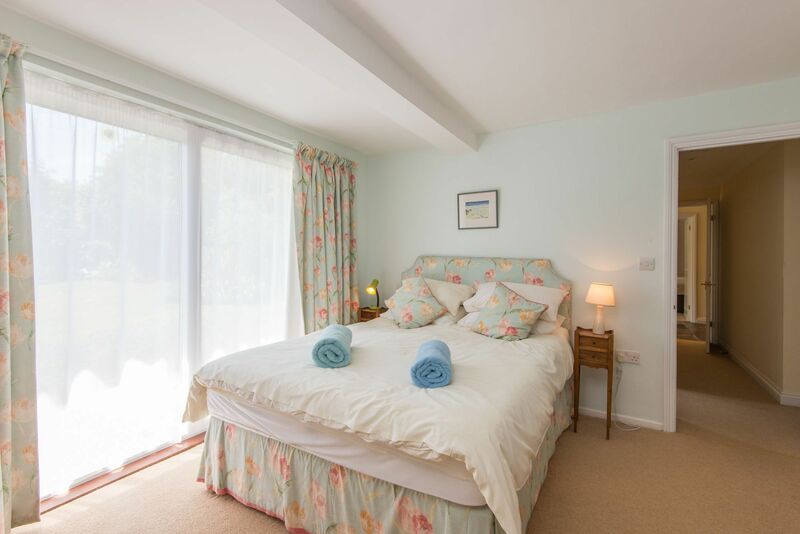 A further double bedroom with a 5" bed also has an en-suite bathroom with handheld shower. There is a twin bedroom with en-suite shower room followed by a further twin room and single room with standard single bed (with truckle bed under the single bed, suitable for a child or teenager only as it is a shorter bed). There is an additional shared shower room. There is a utility room, boot room and double shower / wet room and separate WC. First Floor: Stairs lead to the study area, with separate WC, through double doors into the main living room with balcony overlooking the garden. Double doors through to an open plan kitchen and sitting room with central island and river views. The main dining room has antique furniture including a long dining table with views both out over the garden and to the rear the Percuil River. Exterior: Garden with external furniture and BBQ facilities. Heating is via central heating throughout. The first floor kitchen has a range of equipment. There is a gas hob and two electric ovens, kettle, toaster, microwave, dishwasher and fridge / freezer. The utility room / secondary kitchen has a further microwave, dishwasher, washing machine & tumble dryer. The sitting room has a flat screen TV & DVD player. There is WiFi available at the property and a PC is provided for guests use. There is an iron & ironing board available. Electricity, heating, bed linen and towels are included, but you will need to provide your own beach towels. There are parking facilities for up to four vehicles. Well behaved dogs will be permitted at a small additional cost of £30 per dog / per week. Regrettable no smoking is allowed. There is a high chair available. Discounts available for up to six people staying for 7 nights outside the peak season, using up to three rooms only.